The fame of Stonehenge, the giant ring of standing stones as well as the mystery surrounding this prehistoric monument in Wiltshire, England, located two miles west of Amesbury and eight miles north of Salisbury, has led to numerous efforts at re-creating it. There are dozens of replicas throughout the world made out of a variety of materials. Some have been meticulously constructed as astronomically aligned models, some as socioeconomic statements, while others are examples of artistic expression at its best. No matter what their purpose might be, they mostly stand as tourist magnets, as fascinating as the original monument itself. Or at least, to some extent. 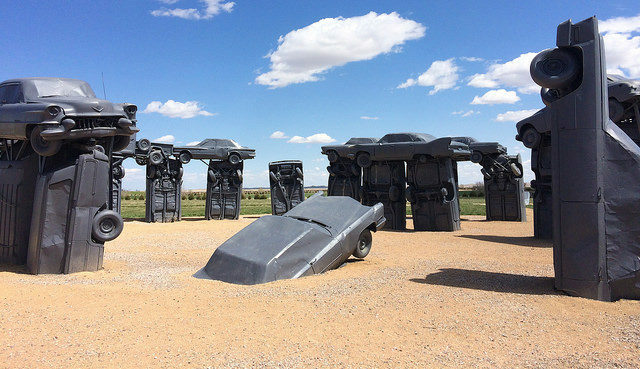 The one that got our attention recently is not your usual Stonehenge replica; instead of being built with large standing stones, this one is entirely created from vintage American spray-painted cars. Rising like monoliths from ancient times, 39 automobiles, all arranged in a circle, rest as a formation of vehicles from days gone by on the western outskirts of the Sandhills of Nebraska. 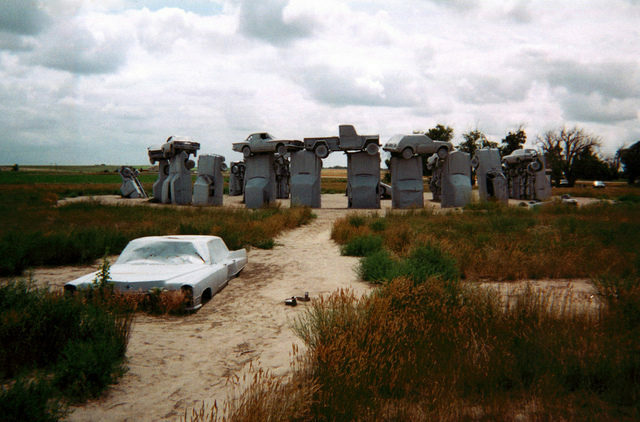 “Carhenge” can be found in the close vicinity of the city of Alliance, Nebraska, in the High Plains subregion of The Great Plains. It was built in 1987 by Jim Reinders as a memorial to his father and mimics Stonehenge’s dilapidated state of today, rather than the initial megalithic circle that mysteriously formed sometime between 2500 BC and 2000 BC. Reinders, recognized as an experimental artist and known for his interesting creations and a long history of using unusual media, shortly after his father died in 1982, decided to commemorate him. 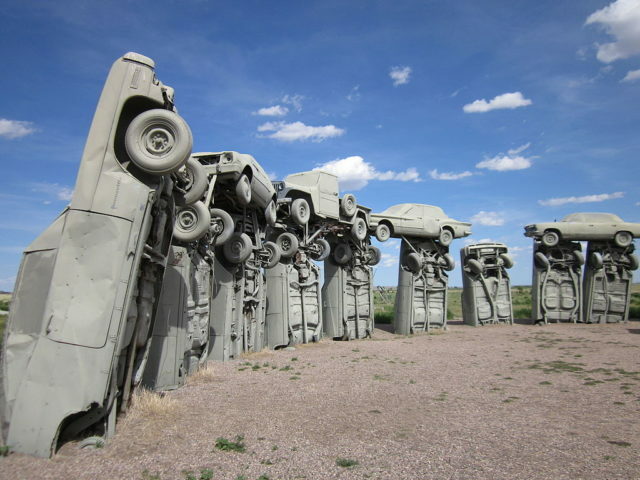 After some thought, he came up with the idea to build “Carhenge.” Five years later, assisted by some family members, or to be more precise, 30 of them, Reinder used 39 automobiles, placing them in a way they would mirror the position of the rocks that form Stonehenge. Comparison between “Carhenge” in the middle of the USA and Stonehenge in the UK. Author, Edgy01 (Dan Lindsay), CC BY-SA 3.0. When Raiders lived in England, he spent a lot of time analyzing Stonehenge’s structure, giving much attention to its design, which later helped him mimic the structure’s shape, proportions, and size to an exact state. The automobiles, including a pick-up truck, an ambulance, and a 1962 Cadillac as the heel stone, are arranged in a circle measuring about 95 feet in diameter, accurately and proportionately depicting the real life structure. Some of the cars are held upright with their trunk end buried in five-foot-deep pits, while others are placed atop so they would form the arches. All are covered with gray spray paint, and a 1962 Caddy has the honor of depicting the heel stone, the single large block of sarsen stone standing within the Avenue outside the entrance of Stonehenge. After Carhenge was dedicated on the Summer Solstice in 1987, Jim and his whole family celebrated the occasion drinking champagne and reading poetry, songs and a play written by the family. 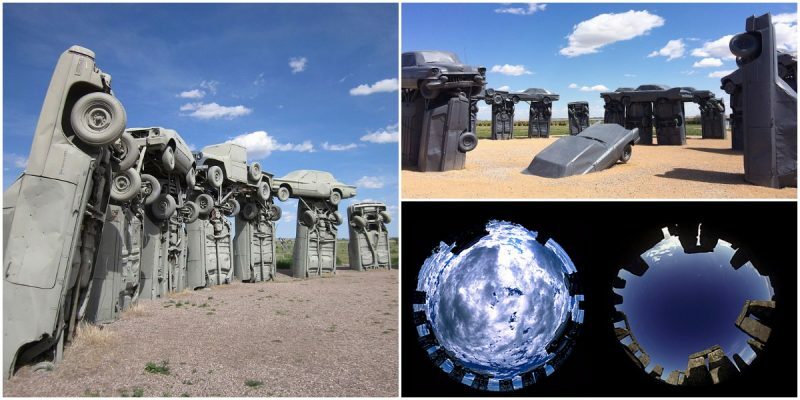 It took about a year and Carhenge was already a sensation, and because Reinders only wanted to commemorate his loving father, he decided to donate the 10 acres of land where Carhenge stands to the Friends of Carhenge, who have preserved it till 2013. The same year, on October 1, 2013, Friends of Carhenge gifted the site to the Citizens of Alliance. Today, due to its uniqueness, Carhenge continue to draw the attention of various film and television production crews as well as over 60,000 visitors from all over the world each year and is available to the public 24/7. Not only that, for any who decide to come, can also enjoy the additional sculptures erected at the site, now known as the Car Art Reserve. 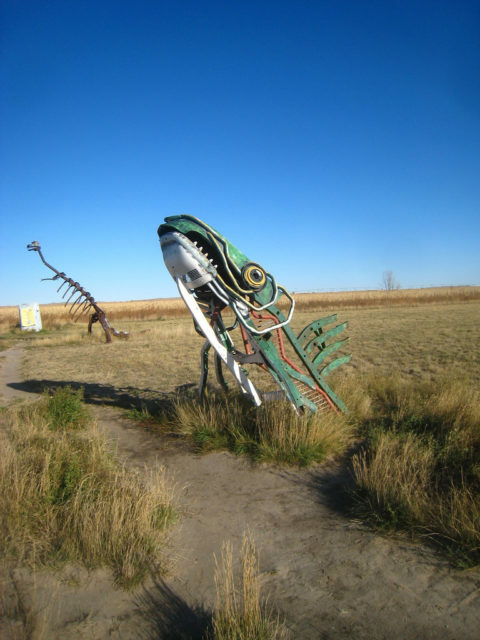 One of the first sculptures that was added to the Car Art Reserve, right beside the Carhenge, is a sculpture of a spawning salmon. The sculpture is a creation of the 29-year-old artist Geoff Sandhurst from Canada who won a $2,500 prize and placement of his car art creation at the Reserve. 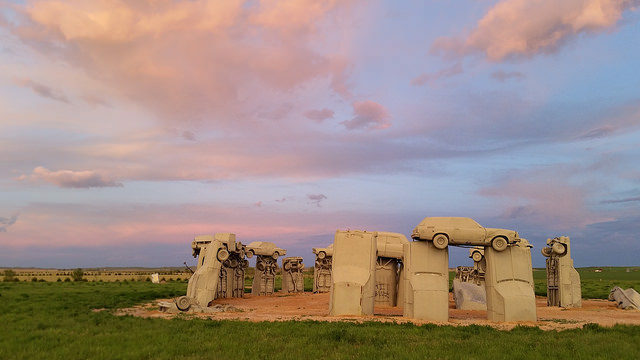 In addition to the salmon and the Stonehenge replica, the Carhenge site is enriched with several other sculptures made from automobiles and covered with various colors of spray paint. In 2011, this creative replica was listed for sale for a price of $300,000. 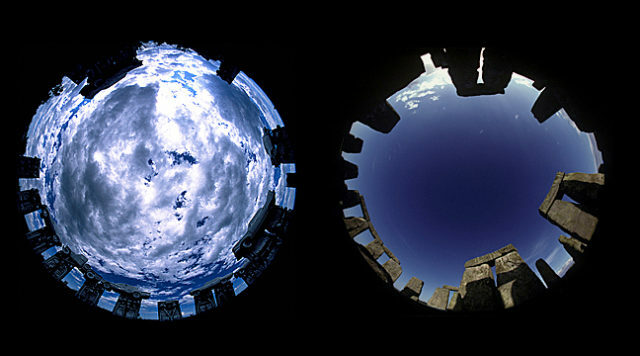 In 2005 David Liban filmed a documentary, Carhenge: Genius or Junk?, in which he explores the idea behind this project, as well as its current significance to the world. Two years later the place deservingly earned the right to be included in 1,000 Places to See in the USA and Canada Before You Die, the 2007 edition of one of the most prestigious travel magazines in the world. On August 21, 2017, Carhenge will be in the path of the Solar eclipse.